I used to be an avid deer hunter but gave it up about 20 years ago. I just sort of burned out, and my interests shifted elsewhere. If you hunt or just like shooting, you have probably accumulated a few firearms. Among them is likely one that is very special to you, one that when you handle it, your mind is flooded with memories, hopefully, good ones. I have such a rifle. It is a rather strange creature that started out its life just over 100 years ago, in 1917 to be exact. It is a Model 1917 rifle, often referred to as the U. S. Enfield or American Enfield (More on that later). It began life as a military rifle, probably serving with the Army. Its history back beyond 1970, when I came in possession of it, is known to me only through what has been recorded by historians writing about the M1917 in general. When the U.S. entered WWI, the standard infantry rifle was the Model 1903 Springfield, a marvelous product of American gun making. However, upon entering the war, America was woefully short of M1903s, and it would be impossible to increase production fast enough to meet the war needs. But there was a solution. It resided in the form of a rifle Remington Arms had been producing for the British to supplement their shortage of what the Brits called the Mk 1 Short Magazine Lee Enfield, or SMLE (pronounced “Smelly”). They had been working on a replacement rifle in caliber .276 Enfield instead of their then standard .303 caliber when the war started. This rifle was called the Pattern 13 or P13. They quickly canned the idea of changing calibers as impractical with a war cranking up. With British gun makers pumping out SMLEs as fast as they could and maxed out, they approached American gun manufacturers to make the new rifle but in standard British caliber .303. That stop-gap rifle became the Pattern 14 Enfield or P14. About the time America entered the war in 1917, the British had finally reached the point that their supply of rifles was meeting demand, and they canceled the remaining orders with American suppliers. This was fortuitous for America. Unable to meet the demand for M1903 rifles for U. S. needs, it was determined that since Remington, Winchester, and Eddystone had all the tooling in place and ready to make rifles, it would be much quicker to simply convert the British P14 from the British .303 caliber to the standard American caliber .30/06, and a new rifle was born, the M1917. Mine is a Winchester. More M1917s served with American Expeditionary Forces in Europe than M1903s. When the war ended, America reverted back to the M1903 as their primary rifle and relegated the m1917 to war reserve status. It was brought out of reserve status during WWII and issued to some rear area troops, used for training, and loaned to allies. With WWII ended and the American semi-auto M1 Garand rifle developed just before WWII in active service, the U. S. began ridding itself of the surplus M1917 and M1903 rifles. Many of these found their way into the civilian market. The M1917 was particularly liked by gunsmiths to build custom rifles in magnum calibers. The reason it was preferred is that the action was very robust and able to stand the higher pressures of these magnums. My particular Winchester M1917 went through this process and was converted to a sporting rifle with a scope sometime before I acquired it. It was left in .30/06 caliber and retained its original barrel. I traded for my rifle in 1970 and took it to Alaska with me when I was transferred to King Salmon AFS in 1971. 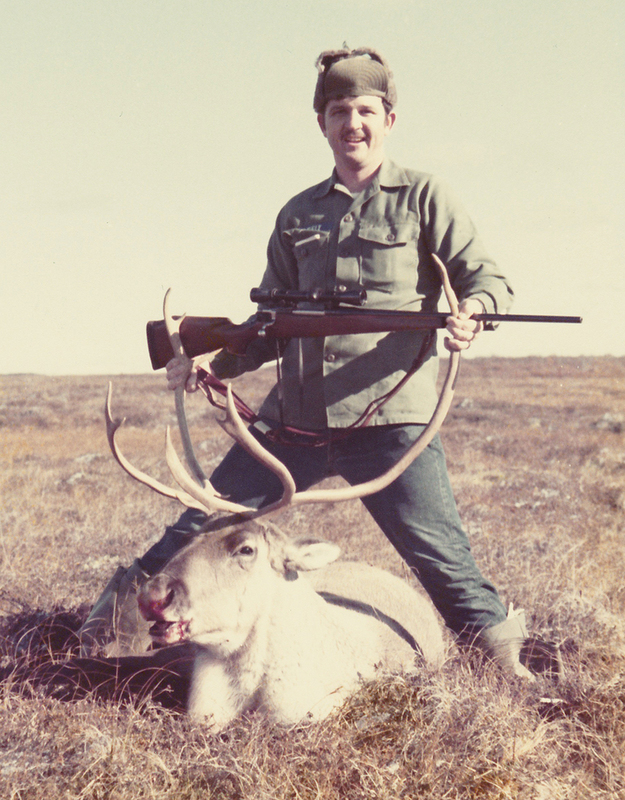 I hunted with it there in the fall of 1972 and took a nice caribou bull. After I was discharged from the Air Force, I hunted whitetail deer with it in Louisiana, Mississippi, and Alabama, taking numerous deer. The rifle always shot well even though the barrel’s bore was pitted from the use of corrosive ammo during its military career. Along about 1990, I decided the old girl needed a facelift and had her re-barreled with a brand new barrel. Then I had the whole works Parkerized. Parkerizing is a protective metal finish used by the military on small arms. It is usually a dull greenish-gray or charcoal black finished. Mine was a working rifle and not a safe queen, thus I thought Parkerizing was more appropriate than a high-gloss blue, which would have been prettier. In addition to re-barreling and refinishing, I bought a new stock for her, a nice laminated wood stock, which I shaped to my desires and needs. I chose resin impregnated laminated wood instead of some fancy grade of walnut because it is virtually impervious to weather and warping. I did this for the same reason I chose the Parkerized finish. I finished off the rebuild with a really nice new Burris scope. In effect, I had a brand new rifle, and the only remaining parts of the old was the heart, the action. It is fairly common for gunners to name their favorite firearms. I had never done that for my 1917 and decided it was time. In testing ammunition loads in my “new” rifle, I discovered she really liked Winchester Black Talons and easily put three shots in a group well under an inch at 100 yards. So, “Black Talon” she became, and I even had a small nameplate made and mounted on the side of the stock. Black Talon is semi-retired now, but every time I take her out of the safe for a cleaning, my mind is flooded with the memories of the many adventures we shared together.